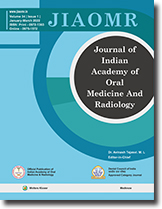 Journal of Indian Academy of Oral Medicine and Radiology (JIAOMR) (ISSN: Print - 0972-1363, Online - 0975-1572), an official publication of the Indian Academy of Oral Medicine and Radiology (IAOMR), is a peer-reviewed journal, published Quarterly , both in the form of hard copies (print version) as well as on the web (electronic version). The journal’s full text is available online at http://www.jiaomr.in. The journal allows free access (open access) to its contents and permits authors to self-archive final accepted version of the articles on any OAI-compliant institutional / subject-based repository. The print version of the journal is available to the life members of IAOMR and paid subscribers. The journal does not charge for submission and processing of manuscripts, and does not apply any additional charges for color reproduction of photographs. However, the journal applies nominal publication charges (which are mentioned on the website) for every manuscript accepted for publication.